With all the internet talking about the Fantastic Four movie it seems, it's happy timing for Marvel that Fantastic Four #1 launches next Wednesday, from the creative team of writer James Robinson and artist Leonard Kirk. Part one of The Fall of The Fantastic Four, Marvel has released the below four page preview, which shows not only the amazing potential in power of The Invisible Woman, but true undebatable core aspects of the best team in comics; Ben telling Reed to quit yapping, and a Thing / Human Torch rivalry that is concerned one minute, cheeky as all hell the next. Marvel says: "The Fall of The Fantastic Four" Part 1. 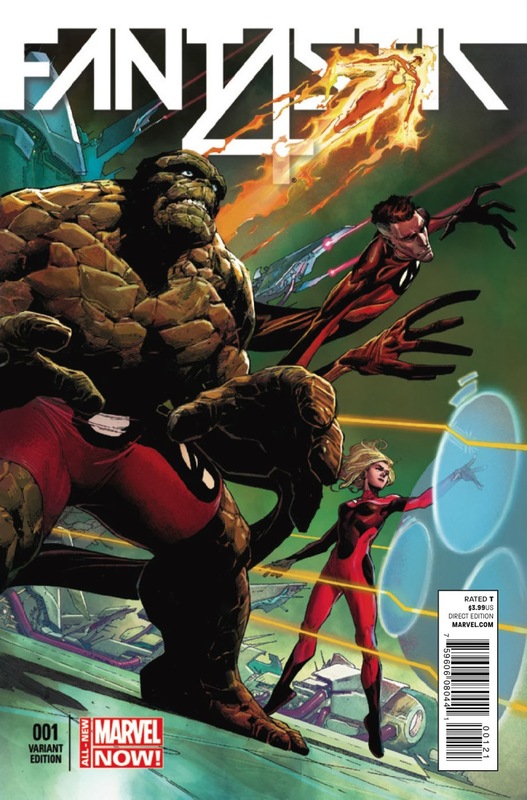 The world's greatest comics magazine begins anew with Marvel's First Family, the Fantastic Four! But as the brilliant Mr. Fantastic, the compassionate Invisible Woman, the ever lovin' Thing and the hot-headed Human Torch embark on a strange mission, they aren't met with new beginnings, but an untimely end! As the family of cosmic explorers head towards their darkest hour, who could possibly be behind their downfall? And how is one of their oldest enemies, the sadistic dragon known as Fing-Fang-Foom involved? Prepare for the fantastic! Loving the take - charge attitude Reed has , combining his stretching ( nice to see him USE that) and his intelligence and leadership skills. Great to see Sue mention she finds hold her force field tough. ..a tiny bit of vulnerability there. Some banter between Johnny and Ben...but sadly from this Johnnys immature attitude is still intact. Hopefully losing his powers will grow him up. Thanks Karl! Mate I agree it's early days but Kirk's Thing to me looks awesome. Ben may be the most popular of the team, but he seems the one that exposes any unprepared artist the most. I loved the opening. And I'm looking forward to this being one of the all-time great runs. I can just feel it.